The Legend Course is the jewel in Belle Mare Plage's golfing crown. The course skirts one of the island's most idyllic beaches and has been carved through the wildlife-rich forests of Mauritius' east coast. The course has constructed in accordance with USGA guidelines and thus its greens are renowned for their true, slick surfaces. Each hole is truly unique around this most amazing course and the golfer is treated to breathtaking views from all over the course. 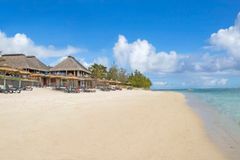 Added to the Belle Mare Plage portfolio in 2002, the Links Course measures 6,518 yards, and was designed by Rodney Wright in conjunction with golfing legend Peter Allis. The par 71 layout has matured nicely since its inauguration and has helped to ease the traffic around the famous Legend Course while growing popular in its own right as time passes. The same water features and woodland that define the Legend Course are apparent here but that is where the similarities stop. Generous fairways and rolling undulations give the course a links feel and golfers will have to manage their way around the course in order to post a good score. With the club house in sight, golfers have to hold their nerve to carry the water that guards the final green at this magnificent resort course. C Mauritius is a nature-inspired vibrant place with a fine selection of foods and refreshments, welcoming outlets where you can relax and enjoy. Relish the present and seek the future in a social and vivid atmosphere. There are 52 Prestige rooms split into 26 Prestige rooms, 18 Prestige Sea view rooms and 8 Prestige Beachfront rooms. Each and every room includes various equipment including air conditioning, high speed Wi-Fi, mini-bar and tea and coffee service. For dining options, the C Restaurant serves International Cuisine throughout the day, whilst the C Asian restaurant can be booked for an alternative lunch and dinner option. Choose from two 18 hole championship golf courses: Constance Golf Legend & Constance Golf Links. Both courses offer a driving range to warm up prior to the round, and a restaurant and bar, to relax after an enjoyable round.